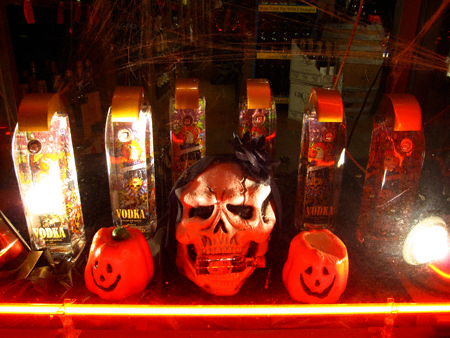 While not as extensive as other Halloweeniana I have featured here thus far, this tableau (which hails from Z & J Wine and Liquor) tickled my funny bone. If you look very carefully you’ll notice a bottle of Sobieski vodka has been placed in the skull’s mouth. Nice. In closing, dear readers, something closely resembling the sun appears to be in the sky. Methinks I will go out for a while and reacquaint myself with it! More to come later today.